If you're looking for an easy-to-care-for freshwater fish that doubles as a conversation piece, you can't go wrong with the Mickey Mouse Platy Fish (also known as the Golden Moon Platy and Moonfish). The Mickey Mouse Platy boasts a "hidden Mickey" located near its tail, is tolerant of a wide range of water conditions, and is relatively easy to breed. Rather than laying eggs, this species bears live young; the appearance of the tiny fish "fry" can be fascinating for both adults and children. Native to North and Central America from Ciudad Veracruz, Mexico, to northern Belize in Central America. Nonnative populations now reside in a number of locations within the United States, including California, Colorado, Florida, Hawaii, Louisiana, Montana, Nevada, and Texas. Different Platy species live in different river systems; none are considered to be endangered. Wondering where this adorable fish got its nickname? Look closely at the tail area, and you'll discover a "hidden Mickey." Near the base of the tail is a large round spot upon which are perched two smaller round "ears" that give it the spitting image of the popular Disney character, Mickey Mouse. The fish itself may be pale yellow to gold, red to orange, or even bluish in color. The fins may range from pale yellow to red- or black-tinged. There are also long-finned and high-finned versions. Despite the color and fin variations, all are the same species of fish. All Platies have teeth in their upper and lower jaws. 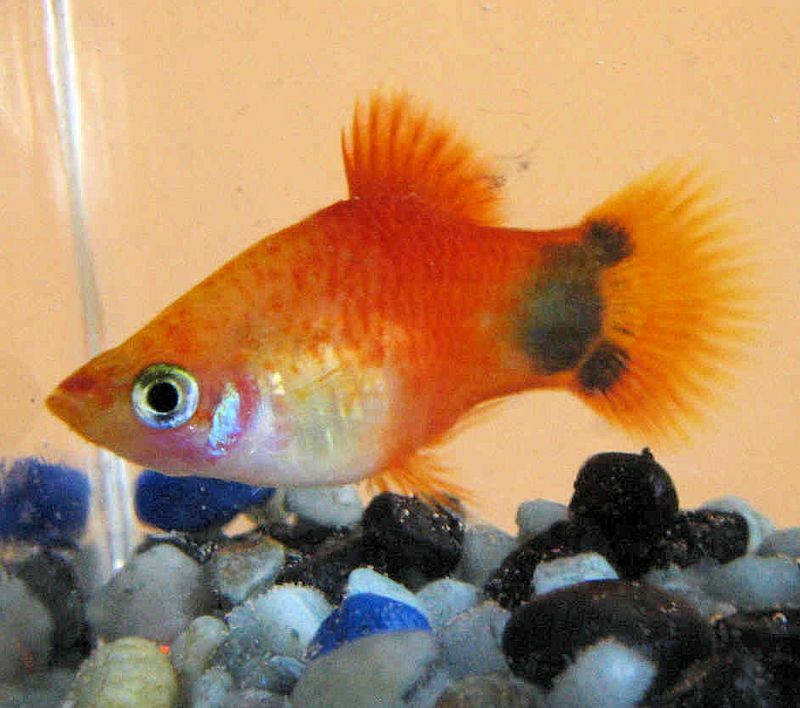 The Mickey Mouse Platy is very peaceful and live sociably with a wide variety of other fish. Because they are not schooling fish, they don't need a great deal of room to move. Small tanks, therefore, are very comfortable habitats. Mickey Mouse Platies often prefer the company of other members of the Xiphophorus family. These are all livebearing fish, such as Guppies, Mollies, and Swordtails. Other compatible tankmates include Angels, Catfish, Danios, Gouramis, and Tetras. The Mickey Mouse Platy fish is a terrific choice for new aquarium owners. Like other platys, the Mickey Mouse tolerates a wide range of conditions, and are suitable for even small aquariums. They will graze on vegetation, so keep that in mind if you have live plants. The ideal substrate is small to medium-sized and darker in color, which also serves as a good contrast to show off the pretty colors of this fish. Water conditions are not critical. Alkaline water of moderate hardness is ideal, which is very similar to most city tap water. The temperature of a typical community tank, 76–78 F, will do quite nicely for the Mickey Mouse Platy. In nature, this fish feeds on live foods such as insects and worms, as well as vegetation. However, they are not picky and accept virtually any food, including flake, freeze-dried, frozen, and live foods. A varied diet including plenty of vegetable matter ​ensures good health. Fresh produce such as lettuce, spinach, cooked peas, or zucchini will be readily accepted. In lieu of fresh veggies, try spirulina. Live foods, such as brine shrimp, glassworms, and bloodworms, are a good supplement. Frozen or freeze-dried varieties of the same foods offer a good alternative. Like all live-bearing fish, Mickey Mouse Platy exhibit sexual dimorphism, meaning males and females have externally visible physical differences. Females are generally larger, and sometimes are less vibrantly colored than the male. Males are easily recognized by the presence of the gonopodium. Males also have a more pointed caudal fin. Once mating has occurred and the eggs are fertilized, it takes about 30 days for the fry to emerge. The temperature can slow down or speed up the process (warmer water shortens the gestation period). Typical broods are 40 to 60 fry and born live. As the fry develop, the belly of the female becomes larger. Eventually, the eyes of the fry can be seen through the stretched belly of the mother. As birthing time draws near, you should be prepared to shelter and protect the fry. Otherwise, the parents and any other fish in the tank will eat most if not all of them. One option is to place female in a breeding trap just before birth. The trap is designed so the fry fall through slits that are too small for the mother to follow. The negatives of this are that the small trap is stressful for the mother, so she must be moved before she begins giving birth. Another method is to have a separate birthing/nursery tank that is heavily planted with fine leafed vegetation. As the fry are born, they hide in the plants. Once the mother had given birth to all her fry, she is removed, thus protecting the fry. The fry are fully formed, very tiny fish. Initially, they need very fine foods to feed upon. Freshly hatched brine shrimp are ideal, but liquid or powdered fry food will do fine. Feedings are required several times per day, which means debris will build up more quickly in the tank, thus requiring daily water changes. Should You Put Giant Danio in Your Aquarium? Is the Coolie Loach or Kuhli Loach Right for Your Aquarium?